A multi-dimensional array is an array of arrays. 2-dimensional arrays are the most commonly used. They are used to store data in a tabular manner. 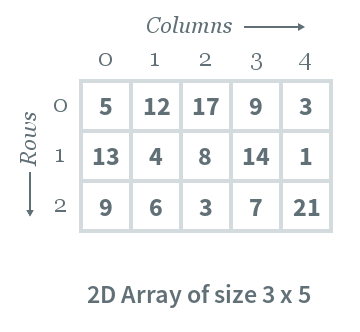 Consider following 2D array, which is of the size $$3 \times 5$$. For an array of size $$N \times M$$, the rows and columns are numbered from $$0$$ to $$N−1$$ and columns are numbered from $$0$$ to $$M−1$$, respectively. Any element of the array can be accessed by $$arr[i][j]$$ where $$0 \le i \lt N$$ and $$0 \le j \lt M$$. For example, in the following array, the value stored at $$arr[ 1 ][ 3 ]$$ is $$14$$. Initializing an array after declaration can be done by assigning values to each cell of 2D array, as follows. This is quite naive and not usually used. Instead, the array elements are read from STDIN. These methods of declaration, initialization, and processing can be extended to 3D or higher dimensional arrays.